MidAmerica Basement Systems has a long history of experience in eliminating, preventing, and controlling dry rot infestations in homes throughout Illinois and Iowa, including Bettendorf, Pekin, Marion, Freeport, Waterloo, Muscatine, Galesburg and areas nearby. If you have a dry rot problem in your home and would like more information, call or e-mail us today for a Free Estimate! MidAmerica Basement Systems can help you eliminate dry rot problems at their source. We can dry your basement or crawl space, eliminate flooding problems, and seal out humidity. 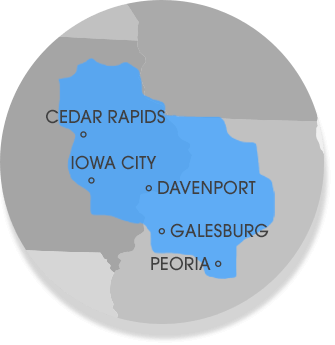 We service Illinois and Iowa, including Cedar Rapids, Peoria, Waterloo, Davenport and nearby areas such as Normal, Iowa City, Dubuque, Rock Island, Clinton, Moline, East Peoria.